New York Mets starter Matt Harvey has taken full advantage of playing the Big Apple over his four years as a pro -- frequenting Knicks games, Rangers games, fashion shows and appearing on late night television all in recent months. New York definitely presents plenty of options during the offseason for a young player. 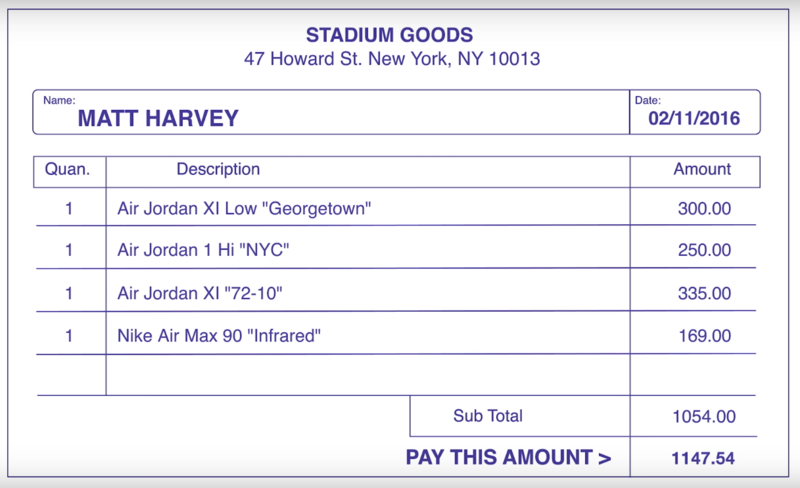 The Mets reported to spring training earlier this month, but before he put the punctuation mark on his offseason, Harvey tagged along with Joe La Puma of Complex to do a little bit of sneaker shopping. Needless to say, the ace put some of that $3.7 million raise to use. The North Carolina alumnus of course has some Jordan brand ties, so a couple pairs of Jordan 11s were on his shopping list -- as well as a pair of Air Max 90s. His most prized (former) possession -- a pair of powder blue "Ultimate Gift of Flight" 11s that were stolen from him in college -- weren't available in his size. Shame. The four pairs he was able to get his hands on, though, totaled out to more than $1,100 -- or a fraction of his $4.3 million salary for 2016.